This blog shall be updated with some snaps taken at random instants of time. Submitted my M.S. thesis today. 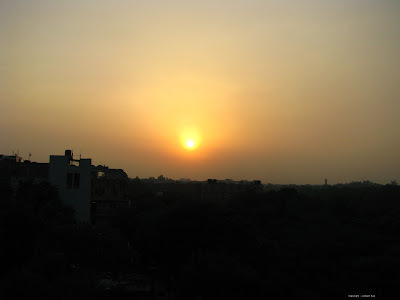 The first photo depicts the sunset as seen from Block VI. The last of the sunsets I shall see from IIT as a student. Time to get a bit emotional, however the birds made me forget all this. 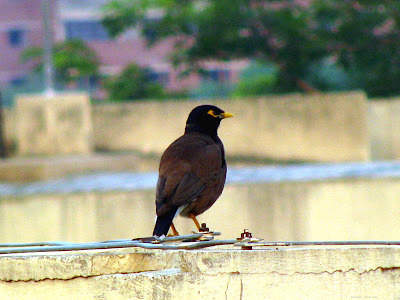 The next photo is of the most common bird you will see in IITD. Apart from trees they have their nests in broken lights shades, tube-lights, between redundant long overhead cables, etc. It was taken with a little digital zoom, hence it is a bit blurry and out of focus. 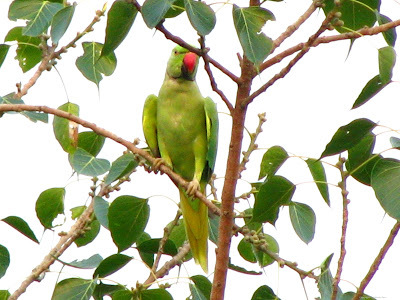 You get to see a lot of parrots in the evening heading to the rose garden and the deer park which are right next to IIT. Here is one of them. As in the case of the previous picture I had to use a little digital zoom. 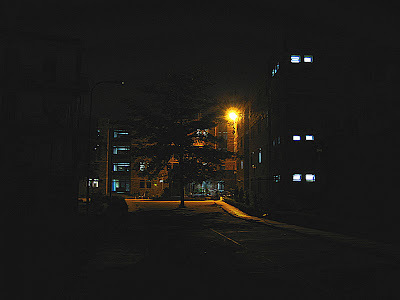 The next photo was taken at midnight while I was returning to my room. It was taken next to the CSC entrance which is always closed :). I wanted to take a snap of the planes landing, hence I needed a place where I can keep my camera still for about 10 seconds as my hands are not as steady as surgeons. I wanted to take a few snaps of the main building but the sun was very bright and with all the sweat I was drained. The snaps I took didnt come out well, either I got only the clouds or got only the building. Guess it is time for an SLR as I find it a bit difficult to take photos without a viewfinder now. Decided to head back to my lab, when on one tree right next to my lab I found this squirrel relaxing. This was the best snap I took today. 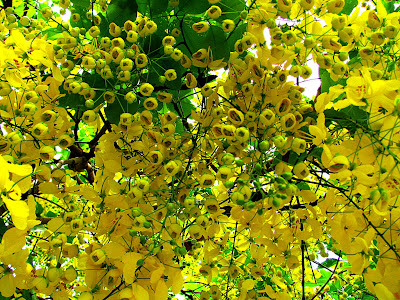 This snap is of the Champa tree next to Scoops. 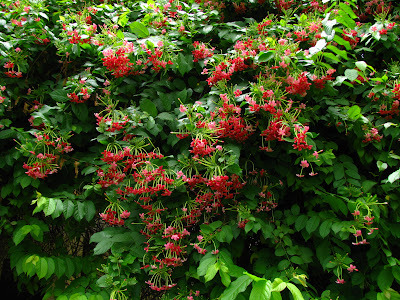 They have a distinct fragrance which is very soothing and relaxing, especially after a sweaty walk from the Hostel. The flowers and the fragrance kinda attract me no matter how blistering the sun is. On my way back I was stopped by some cute squeaking noises. It was coming from the door of a lecture theatre. I was a bit curious as I the sound was that of excitement. 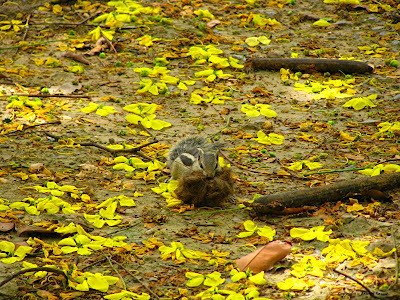 To my amazement it was a curious little baby squirrel. 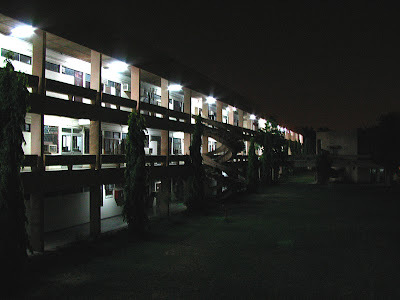 This snap was taken from the first floor of Block II (Electrical Dept). I normally do not take this route while going back to the hostel so this site was a bit new for me [motivation for the snap :)]. It was a Saturday and I decided to go to lab after lunch. I had my camera with me today (normally I do not carry it with me around and keep it safe under lock and key) so decided to take some snaps on my way to the lab. The Sun was high so the colors that came were rich and I did not have to use GIMP to manipulate the brightness & contrast this time. 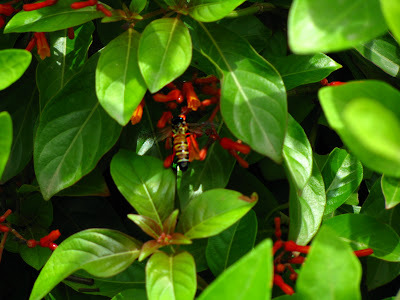 The bees were moving continuously and I had to take many snaps before I got get a clear one like this one. 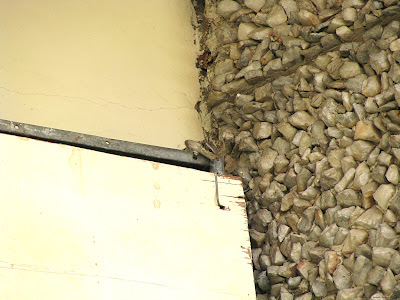 The next one was of the creeper on the passage between Block III and Block IV. The smaller version is a bit hazy, download the photo to see the petals. I was tired and unable to concentrate because I had slept only for about 3 hours the previous night (just completed my first three chapters of my thesis). It had just rained here and it seemed like twilight even at 4 in the afternoon. Decided to play with the Manual Mode of my camera and started playing with the F-number and shutter speed. This was taken with f/4.3 and shutter speed of 1/12 seconds. The bird was busy pecking the soil when it saw me and decided to show me the true colors of its beak. It was a bit dark and I guess I should have increased the exposure time. 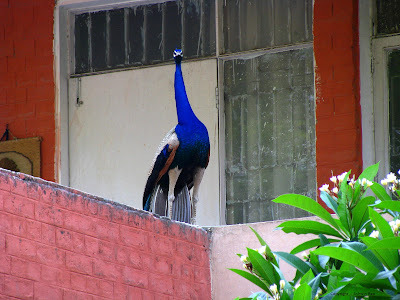 I was not contended with the photos of the Peacock taken last time, so when Vaibhav asked if I could come with him to Nescafe, the first thing I did was to take my camera. 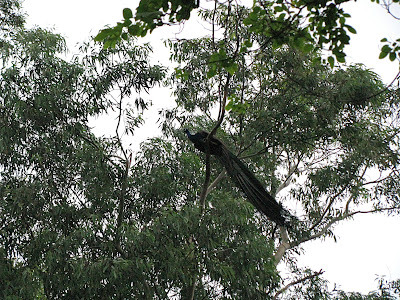 We then went out in search of Peacocks. 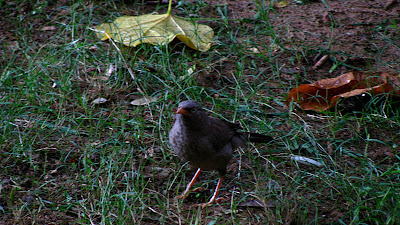 It had rained so most of the bird were out pecking the soil. 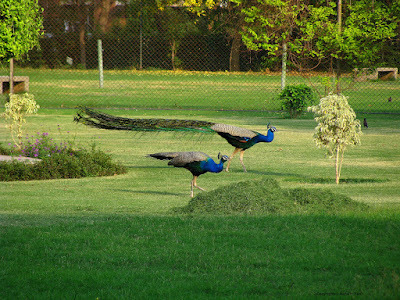 The peacocks too were in a playful mood. We had to take about 10-15 snaps before we could get a still photo of a peacock. This one was the best of the photos we took. 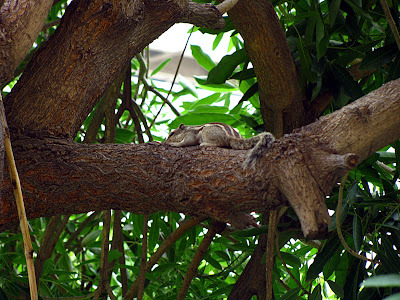 On our way back we found this one resting on top of the tree. This is a very common site during the night. If you are lucky you can witness the small flight of these birds. We then took a snap of the Main Building. 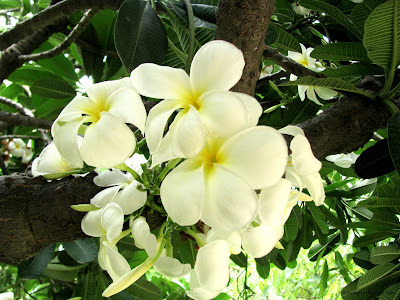 The Main Building is surrounded with the beautiful Plumeria (Champa) trees. It was dark and I do not like to turn on the flash due to the large flash recycle time of my camera. So this is how the flowers look at twilight. Was leaving for Dinner when I saw the moon up in the sky. I wanted to take a few snaps of the Main Building and the moon but by the time I reached the roof of Block VI, the moon had risen high. As I was on the roof, I decided to take the snap of a plane landing. Luckily it was bright enough to get a blue sky, with the shades of the leaves, and the red lights of the vehicles. As the planes land frequently, I didnt have to wait much. Luckily the angle of the descent of the plane was perfect to see the three navigation lights of the plane (which can be seen if you click on it and zoom or download the photo). You can see 15 flashes of light in the sky, one for each second of the exposure. Unseasonal rains this summer have made the traditionally unbearable weather of Delhi to tolerable levels. The photo below is of the footpath from Bharti School to Zanskar Hostel. The footpath is adjacent to the ground and was constructed about 6 months back and has been repaired more than once for various reasons. I guess repairs shall commence in a few days once again. 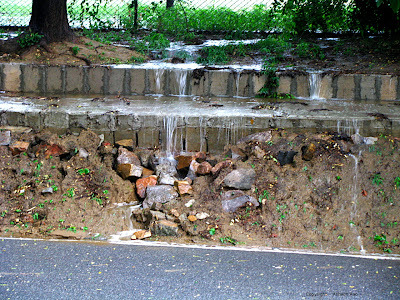 The snap shows the water from the ground eroding the footpath and its foundation, resulting in a mini landslide. The photo is a bit out of focus as I was trying to protect my camera from the rains. There were 15 minutes for the clock to strike 12, the eve of Friday the 13th. 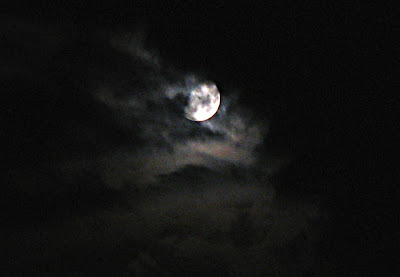 Vaibhav was with me and we decided on taking a snap of the moon on our way back to the hostel. This photo was taken from the pathway connecting Block V to Block IV. There was an eerie glow in the clouds which we tried to capture in this photo. As most of exit points of the blocks are closed in the night. I have to travel all the way from Block VI (where the Centre for Atmospheric Sciences is located) to the Main Building. 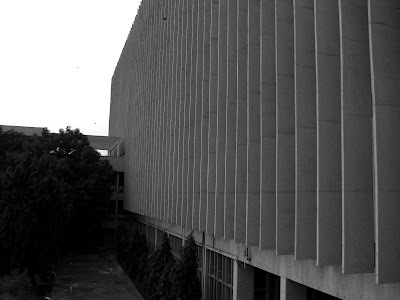 The beautiful Block IV that lies in between has always amazed me, as you can virtually get a very clear view of it. 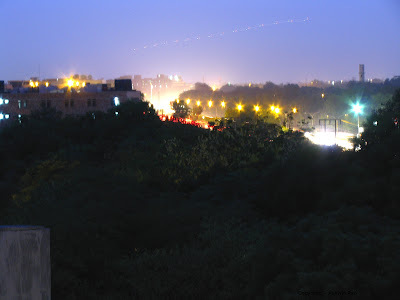 The lights appear like tiny stars placed in a straight line and are very soothing especially after a hectic day. The next snap is of Zanskar Hostel giving a Haunted House look as most of its residents have left. 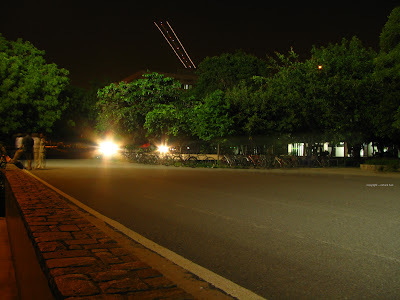 This snap was taken when I was returning from the lab for dinner. 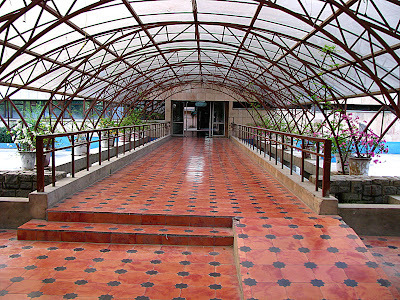 The photo is of the West Wing of Zanskar Hostel. The brick pattern used always amazed me. Was hungry after a long day so decided to go to Holistic (next to Nescafe) with Prem Piyush. He asked me to bring my camera along to take a few photos of the Main Building. The first one is of the passage leading to IRD whilst coming from Nescafe. 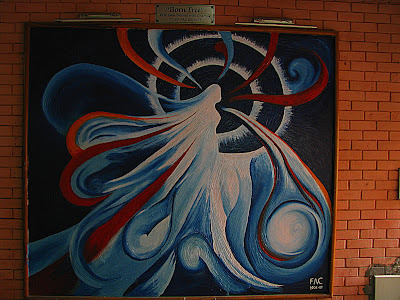 This is an enamel painting depicting freedom put up on the passage to Dogra Hall in the Main Building. The next one is of the Main Building as seen from the passage next to Dogra Hall. 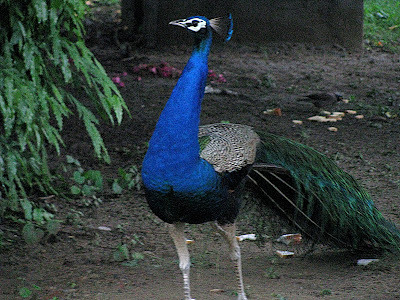 An example of why peacocks consider IIT their home. This one was resting on the balcony of one house. I used the soft glow filter on the this picture. 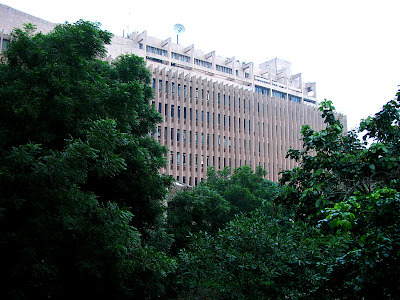 I wanted to take the snap of the source of the yellow petals that have flooded IIT Delhi. I tried many views such as taking the snap of the whole tree with some birds in the background but none of them were coming as I wanted. May be it is time for a wide angle lens . So here is one snap that I found beautiful. I used the Unsharp Mask filter of GIMP and increased the brightness a little. The snap given below was taken on the way to my Dept. (Block VI at IIT Delhi) on Saturday 31st of May 2008. The squirrel was pretty curious on what I was doing and decided to leave only after I was done with snap. A really lucky snap.